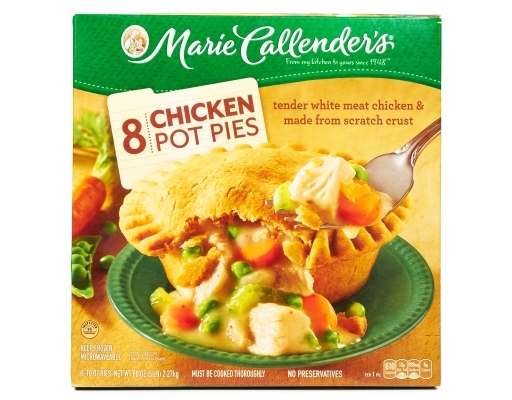 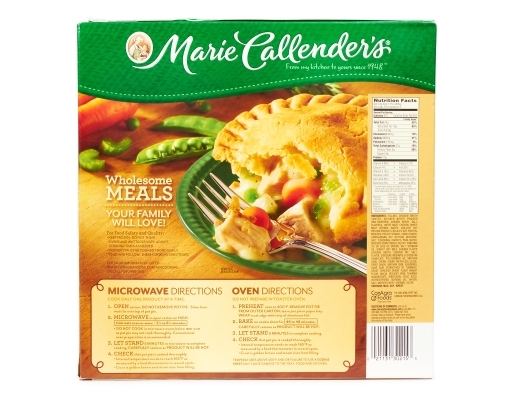 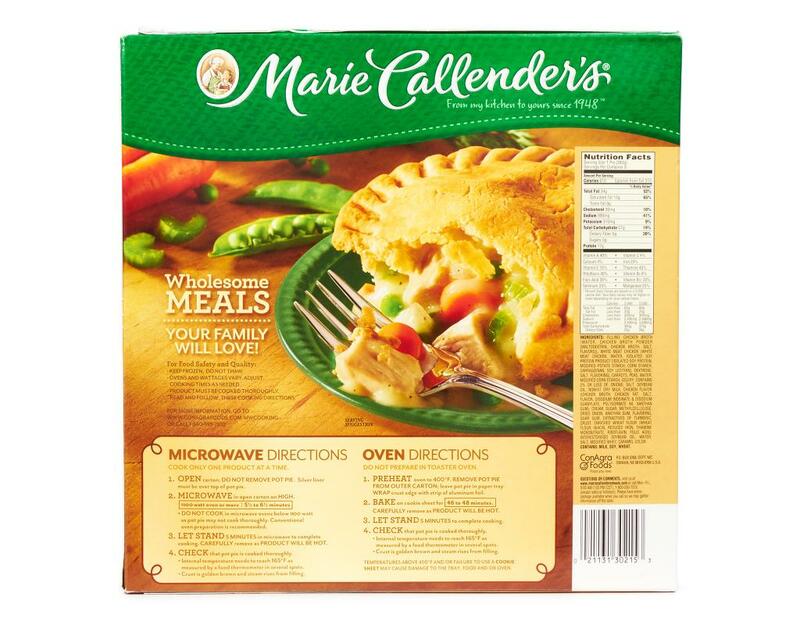 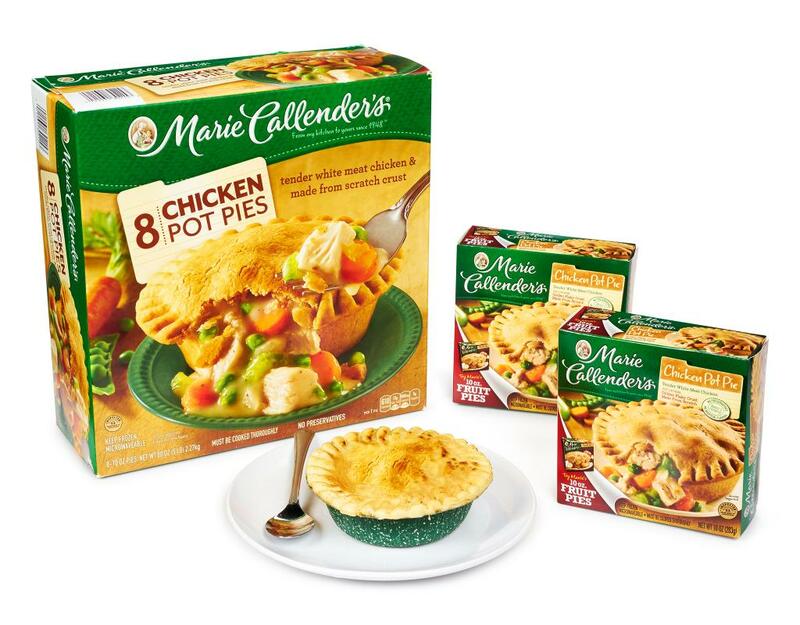 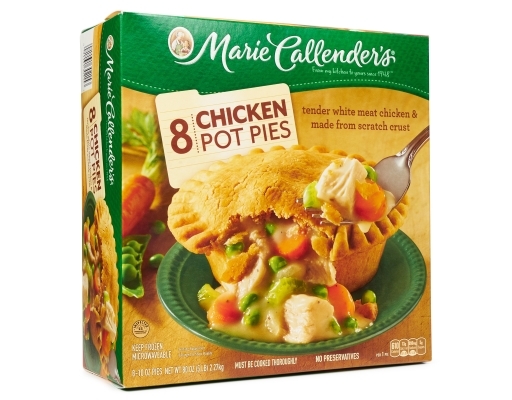 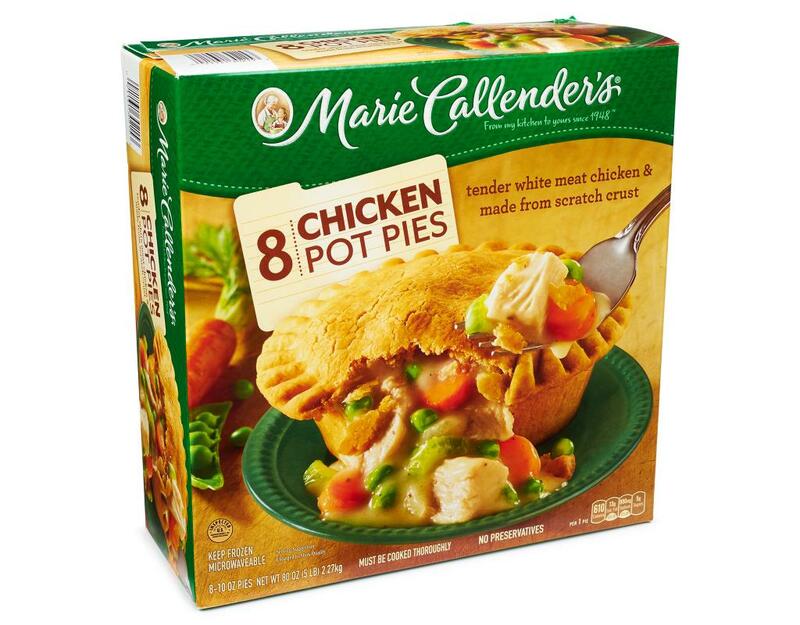 Tender white-meat chicken, carrots, celery, and peas prepared in a golden, flaky crust made from scratch. 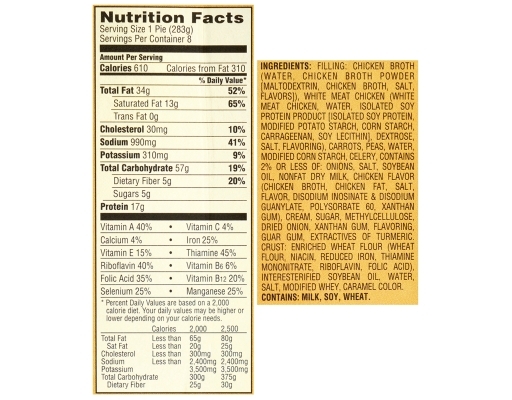 Filling [Water, Cooked White Meat Chicken (White Meat Chicken, Water, Isolated Soy Protein Product [Isolated Soy Protein, Modified Food Starch, Starch, Carrageenan, Soy Lecithin], Salt, Chicken Broth Powder [Maltodextrin, Chicken Broth, Salt, Flavors], Autolyzed Yeast Extract, Flavoring), Carrots, Half and Half (Milk, Cream), Peas, Contains 2% or less of Each of the Following: Celery, Modified Cornstarch, Onions, Rendered Chicken Fat, Salt, Soybean Oil, Chicken Flavor (Contains Chicken Stock, Chicken Fat, Sugar, Salt, Flavoring), Chicken Broth Powder (Maltodextrin, Chicken Broth, Salt, Flavors), Nonfat Dry Milk, Sugar, Methylcellulose Gum, Mono- and Diglycerides, Spice, Turmeric, Butter Flavor (Partially Hydrogenated Soybean Oil, Flavor [Butter Oil, Enzyme Modified Butter Fat, Whey Powder, Non Fat Dry Milk Powder], Soy Lecithin [Emulsifier])] Crust [Wheat Flour Enriched With (Niacin, Iron, Thiamine Mononitrate, Riboflavin, Folic Acid), Interesterified Soybean Oil and Fully Hydrogenated Soybean Oil, Water, Dairy Product Solids, Salt, Caramel Color]. 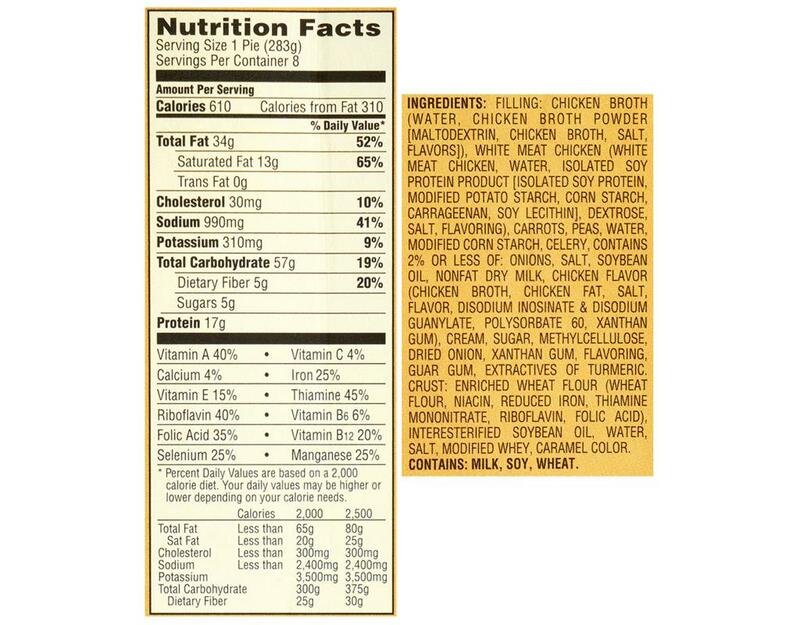 Contains: milk, soy, wheat.